Israel deports 6 Palestinians to U.S. OCCUPIED JERUSALEM, (PIC)– The Israeli Interior Ministry and the Israeli Prison Service (IPS) at dawn on Friday deported six Palestinian citizens from Occupied Jerusalem to the U.S. 33-year-old Kareem Faysal Abu Khdheir, who was banned from Occupied Jerusalem and deported to the U.S., said as he spoke by phone from the Lod Airport: “I was transferred from the Negev jail to the airport on Thursday morning. The Israeli occupation authorities claimed the flight was scheduled for five p.m. on Thursday before they updated me that it was delayed for six a.m. on Friday.” “I was locked up in the airport detention center with five other detainees. Each one of us was allowed to make one phone call only to update his family on the deportation order,” he added. Kareem, from the Shu’fat refugee camp, was arrested by the Israeli occupation forces on September 5, 2015 following clashes with the occupation troops. Right before the detention, Kareem was subjected to heavy beating by the IOF and sustained critical bruises in his chest, face, and teeth. The IOA extended his remand several times despite his deteriorated health status. Deliberations and hearings held by the Israeli Magistrate’s court over the past four months culminated in a verdict that condemned Abu Khdheir, a holder of American citizenship, of involvement in Jerusalem demonstrations and sentenced him to nine months and a fine of 8,000 shekels. Born and raised in the U.S. since October 2, 1983, Kareem Abu Khdheir popped in the occupied Palestinian territories on August 28, 2015 for the first time to get married. He had been held for nine months in the Negev jail on allegations of resisting detention, attacking an Israeli border guard, and joining anti-occupation demos. “Someday I shall return to my motherland, from which I was banned because I attended my friend’s funeral,” said Abu Khdheir. “Someday I shall come back and live on Palestine’s soil for eternity,” Abu Khdheir added as he bid farewell to his family. GAZA, (PIC)– Palestinian factions’ leaders affirmed adherence to resistance as the sole option as well as maintaining Palestinian rights and constants. The factions stressed on the fact that the Palestinian land is an Islamic waqf property that cannot be waived and that Jerusalem constitutes the cornerstone of the unity and civilization of the Islamic world. This came during a political workshop organized by the national Islamic relations committee west of Gaza in the anniversary of the 49th Palestinian Naksa. The Hamas leader Ismail Radwan emphasized during the session on his Movement’s adherence to the Palestinian constants and rights especially the right if return. He called on the Palestinian Authority (PA) to stop counting on the option of negotiation and urged it to halt its security coordination with Israel. The Islamic Jihad leader Ahmad al-Mdalal slammed the PA for its pointless negotiations which have been saught for over 20 years leading to the weakness of the Palestinian national project. The secretary general of al-Ahrar Movement Khaled Abu Helal opined that the Muslims’ preoccupation with other issues than the Palestinian central question encouraged the Israeli occupation to go too far in practicing violations and crimes against the Palestinian people and sacred places. Mitzpe Yericho has stood on this escarpment close to the Dead Sea – the lowest point on earth – since 1978. It is one of more than 230 settlements Israelis have built on occupied land in the West Bank and East Jerusalem over the past half-century. The settlement project began after Israel captured the West Bank and East Jerusalem in the 1967 war. In the 1970s, with the government’s encouragement, large number of Jews began moving onto the occupied land. There are now 550,000 of them. Many live in large blocs near Jerusalem or the ‘green line’ that separates Israel from the Palestinian territories, while others live deep inside the West Bank, in highly protected enclaves or pre-fabricated ‘outposts’ perched on hill tops. All the constructions are considered illegal under international law. Israel disputes this, and plays down the term occupation. Barely a month goes by without a fresh announcement from the government or one of its ministries about West Bank territory being declared “state land”, a precursor to settlement building, or a decision to allow new construction to proceed. “It starts to look irreversible,” said one official, a view separately supported by half a dozen foreign diplomats. 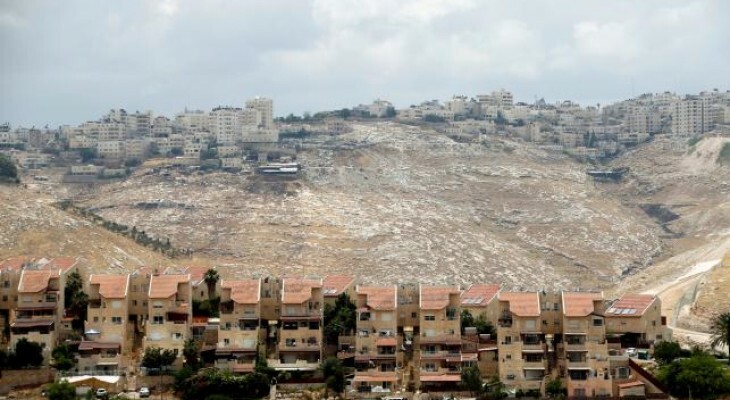 “Settlements are the vehicle for taking control of the land,” said Catherine Cook, an official with the U.N. office for the coordination of humanitarian assistance and an authority on settlements, speaking last month. Within Israel’s right-wing government, there is little appetite to cede any ground to the Palestinians. Netanyahu says their failure to recognize Israel as a Jewish state is the biggest obstacle to peace, not the settlements. Extremist Jewish Rabbi and Member of the Knesset Yehuda Glick’s threats to destroy Al-Aqsa Mosque are aggressive and disgusting, the Palestinian unity government said yesterday. Government spokesperson Yusuf Al-Mahmoud warned that Glick’s comments will increase tensions on the ground and push the situation towards a religious war. “MK Glick would not have made such statements if he was not supported by Israeli Prime Minister Benjamin Netanyahu who made several arrogant and hostile allegations saying that Jerusalem will remain under Israel’s sovereignty,” Al-Mahmoud said. “We are not in a debate with Netanyahu and other extremists, but we are repelling the Israeli occupation,” he added. UN Secretary-General Ban Ki-moon said “grave violations against children increased dramatically” in Yemen because of the Saudi coalition’s involvement. The Palestinian Authority has surpassed itself with ludicrous statements revealing the extent to which it will subjugate itself to the occupation authorities. Speaking during a meeting with Israeli mayors after the appointment of Avigdor Lieberman as defence minister was made public, President Mahmoud Abbas asserted that the PA judged people “on their practices on the ground” rather than in relations to comments or political affiliations. Given the level of collusion with entities supporting the destruction of Palestine, it is no surprise that Abbas is taking an identical approach to Lieberman, who is notorious for his disdain for the international community and intent to destroy Palestinians. Israel has thrived upon an evolution of political rhetoric that pairs purported collaboration and adherence to international law with condescension. It’s a strategy validated by the international community in its scramble to protect the colonial entity in Palestine. There are various implications for Palestinians from the latest declaration by Abbas. Given the PA’s reluctance to consider anything but diplomacy as the means to achieve its objectives, a few carefully chosen words by Lieberman are being interpreted as an acceptance of the two-state paradigm, despite the treachery inherent in such discourse. Although obsolete in practice, the internationally-imposed complicity is still serving diplomatic interests, particularly those of Israel. Whether or not Lieberman is disposed to consider the framework is irrelevant; Israel’s interests are protected by the mere regurgitation of two-state rhetoric. Hence, Abbas has not only invalidated his statements, but also sought to embroil Palestinians in yet another PA gimmick. Apart from the abhorrent insistence upon complicit diplomacy to the exclusion of other options, including legitimate armed resistance, the PA’s perpetual references to, and impositions of, oblivion as opposed to strengthening collective memory, is by far one of the most damaging scenarios for the people of Palestinian. Every action undertaken by the PA is an exercise in oblivion; however, there are instances where Abbas deems it pertinent to issue an explicit recommendation to take that route. Undoubtedly, the PA president is partial to opposing Palestinian collective memory, given that he is undaunted by the overt action which Netanyahu is taking to steer colonialism at a faster pace. Expecting Palestinians to comply, or even feign acquiescence, with the erroneous reference to forgetting Lieberman’s remarks is another story. Such comments should be considered as a form of incitement by Palestinian leaders against the people they claim to represent, even though Palestinians have constantly proved their allegiance to land and resistance, not to Abbas. The only vicious implication as regards Palestinian diplomacy on behalf of the PA is directed towards Palestinians themselves. Mired in complicity, Abbas’ statement only singles out a sliver of Lieberman’s rhetoric while discarding all evidence of Zionist colonial violence against Palestinians, of which the new defence minister has not only been a keen supporter but also a prime instigator during his time as foreign minister. Abbas is basically calling for Palestinians to forget the PA’s role in perpetuating the unending trauma of loss and its collaboration with Israel in its settlement expansion, security, torture and murder. Needless to say, it is also a remark that will add to Palestinian resentment against Abbas and the PA, as well as recognition that an organised strategy emanating from the people is not an option, but a necessity. AL-KHALIL, (PIC)– A video leaked on Thursday evening by the Israeli B’tselem rights group kept record of Israel’s torture of 20 Palestinian children in al-Khalil city a few days earlier. According to B’tselem, the Israeli occupation claimed the children were detained after an Israeli bus was hurled with stones in al-Khalil on Tuesday. B’tselem said the Israeli occupation soldiers arbitrarily arrested 20 Palestinian minors near the Jaber neighborhood after they ordered them to stand against a wall. Testimonies given to B’Tselem and footage filmed by B’Tselem volunteer Suzan Zraqo, who lives in the neighborhood, indicate that the soldiers passed through the neighborhood, gathering, seemingly at random, some twenty children and teens from the streets. The soldiers had them stand against a wall and began questioning them about an incident that occurred in the area earlier that day, in which stones were thrown at an Israeli bus. They then took a photo of every child and teen using a mobile phone. B’Tselem obtained the details of fourteen of these minors, seven of whom are under the age of twelve – the cutoff age for criminal liability. Fourteen-year-old neighborhood resident M.G. gave his account of the events to B’Tselem field researcher Manal Ja’bri on 29 May 2016: “It was after dark. I was playing cards outside with two friends, who are seven and ten years old, and my brother, who is eleven. Suddenly, we were surrounded by Israeli jeeps and lots of soldiers got out of them. Ten of them came over and detained us, and the others spread out along the roads that lead off towards Kiryat Arba.” “The soldiers told us to stand against the wall. We were frightened by the number of soldiers and because they’d detained us,” the child added. “Every group of soldiers was leading several children. I also saw soldiers grab N., who is seven years old, by the neck and lead him toward us. He was crying. They kept us there by the wall for about fifteen minutes,” he further stated. This is not the first instance that B’Tselem has documented soldiers torturing minors in al-Khalil. Several of these incidents have occurred within homes, with the children’s parents present. Given the soldiers’ conduct in this incident, it appears that their goal was primarily to intimidate the children. This demonstrates blatant disregard for the military’s duty to protect the rights of minors. The legality of this course of action is doubtful: the military is prohibited from treating civilians – certainly minors, and especially those under the age of criminal liability – as potential criminals and using soldiers to deter them, the B’tselem statement read. OCCUPIED JERUSALEM, (PIC)– An Israeli occupation court indicted three Palestinian boys in their 17’s of age of carrying out an anti-occupation stabbing last month. The Israeli general prosecutor charged three Palestinian anti-occupation youths with involvement in a stabbing attack in May in the Armon Hanatziv illegal settlement, in Occupied Jerusalem. The three youngsters were also accused of planning an attack on a bus. The Israeli attorney general claimed that a conversation on Facebook showed the three Palestinian boys were seeking Israeli targets and planning to kill Jews. The Israeli government yesterday approved an extra 850 million shekels ($220 million) to develop the city of Jerusalem over the next five years. “This is almost NIS 1 billion that we are investing in the development of Jerusalem, in technology and in companies,” Prime Minister Benjamin Netanyahu said. Palestinians believe this is a further step towards the Judaisation of the city. The announcement came during a special cabinet meeting for Jerusalem Day; a national holiday in Israel that marks the capture of East Jerusalem in the 1967 Six Day War. “The face of Jerusalem is changing. There is an interesting technological development here,” Netanyahu said. According to the prime minister, the extra fund will be invested in technology, business and tourism. Israeli public radio quoted Jerusalem Mayor Nir Barkat calling on the government to transfer the country’s ministries and government institutions to Jerusalem. “The Arab population will not benefit from the projects,” he added. He called on Arabs and Muslims to shoulder their responsibilities towards Jerusalem and confront the Israeli attack against it.